All it needs for a proper tea party is some stuffed dolls in the chairs. Now all we need is for someone to sneak behind the counter and raid the cookies, and Shenanigans will be complete. I don’t think she overheard the exchange between Mr Fairweather and Andi, I think she was too far away. But I do think the alcohol is having a very definite impact. She was next to Andi when he started talking about how bad she was. Then left when the fight before it got worse. How long does it normally take to get hungover? Also it’s good that both are level headed and speaking it out like the adults they’re supposed to be. I figured they could do so. I think that again, Ken was getting very Papa Wolf (which can be a reassuring trait for a parent to have, at least it lets the child know that their issues will be taken seriously) and Andi saw it as coming out of nowhere (“Dude, I never met you, and you are talking trash about my daughter already? Back off!”). Once the atmosphere was not so…charged? Heavy? Whathaveyou? She could take a deep breath, recall “Oh yeah, my daughter had this whole other life before me, and it wasn’t great and she didn’t behave so well” and entertain the notion that Ken may have something to his complaint after all. Which he did. And he could see where the conversation went pear shaped. Also, on an unrelated note, I hope Keisha gets adopted soon. She is shaping up to be a really mature, cool kid. She deserves a loving parent or multiple. Poor kid must be lonely without them. Keisha’s such a good kid. So thoughtful. 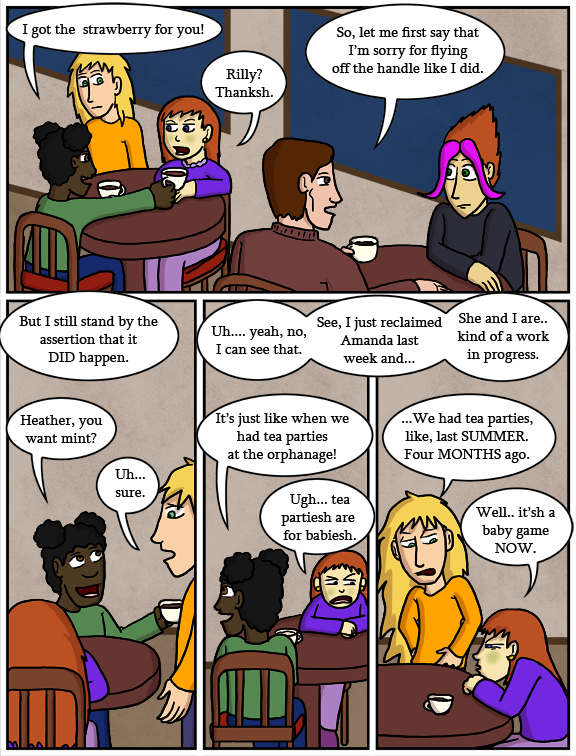 Her multiple cups of cocoa were for sharing… for trying to patch up the breach. She’s as lonely and needy as the rest of the orphans, maybe even more so, but in her, the need manifests as trying to reach out. I really hope Dave’s story will include some happiness for her. I don’t know how long it takes for hangovers to happen, but I recall hearing that they are from the dehydration effect of the alcohol. Your body feels bad because it doesn’t have all the chemicals it needs in all the right places. So that could happen pretty quickly, especially if your body is small compared to the dose. See Andi, that wasn’t so hard. Better late than never. This happened to me at that age. I set up plans for a tea party, and by the time it was time to send out the invitations, it felt childish and silly. Maybe there’s something wrong with my expectations, but I’m sincerely impressed with how civil and maturely this is being handled by the parents and even the children to a degree. Props to them all for handling difference in a very constructive manner. Shenanigans? I have to go get my broom! Where’s the guy with the big hat? And the mouse and the rabbit? They are all required for a PROPER tea party. I’m glad he’s admitting that he ‘flew off the handle’, and knows that his behavior was overly aggressive and unacceptable. Me too, he might’ve felt the need to go all Papa Wolf as someone else said, but that clearly is only going to get you Angry She-Wolf in response. Sitting and talking like civilized beings over coffee is much better. (Fun history fact, the first really effective revolution happened after the advent of coffee, before when people had alcohol they were too hungover to do anything about the grand plans made while drunk, but coffee, ah good ol coffee gets people motivated and clear-headed enough to be effective!) Glad Andi is being upfront about having only had Amanda a week, she’s not trying to retroactively say “My kid is fine and everything’s fine”. I agree. Ken is a good guy, and Andi has potential. It’s easy to forget that Andi has only had her for a week. Someone does not jump into parenthood and become a good parent in 7 days (especially with a troubled child). Andi acted very defensively, which is reasonable considering how he came at her. I’m very glad they’re sitting down and talking calmly now. Ah Keisha keep it up… While the other two are fighting cause of their new families, Keisha is still at the orphanage and fighting to reunite the only family she has… her sisters. The funniest thing about this to me is that I know an old lady who regularly hosts tea parties just because she loves tea parties and no one else will host them. Her lawn is decorated to look like a Hundred Acre Wood miniature replica and she has the parties out near Pooh’s house. Her tea parties are amazing. Glad to check back after this was colored in. I thought Andi was talking to Todd at first! The Great HoboJoedini predicts that Amanda will blow up at Heather for a remark she will soon make. This will be an inopportune time as both Todd and Andi will try and present their case that Amanda is a good kid to Heather’s dad. First, there will be shock, then embarrassment, then hilarity! After a whole day of binge reading i finally read the whole comic. It is something amazing. I am very glad i found it.